What Kinds of Things Can Be Assessed in a Probate With No Will? When a person dies intestate, without a will, the probate court oversees the estate administrator and the division of assets. The court gives priority to the surviving spouse to serve as estate administrator, absent any objections from other heirs. The probate court requires the estate administrator to compile a list of probate inventory to be distributed through the probate proceedings. The estate assets will be distributed pursuant to your state's laws on intestate succession -- when there is no will, the law governs the line of descendants to receive inheritances. When a person dies without a will, the probate court assesses the fair distribution of the decedent's estate based on state law. The probate court defines the property of the estate by dividing it into probate assets and non-probate assets. Non-probate assets are distributed through contractual arrangements made prior to the decedent's death and these assets are outside the probate proceeding. For example, a life insurance policy with designated beneficiaries is classified as a non-probate asset. The decedent named the beneficiaries prior to his death as part of the insurance policy contract. The court oversees the distribution of all probate assets, including real property, personal property and bank accounts. The probate court assesses the fitness of the surviving spouse, another family member or other descendants to serve as the estate administrator. In the absence of any conflict of interest or significant bias, the court often gives priority to administer the estate to the surviving spouse or other close family member. The estate administrator must be able to complete probate documents, compile and inventory probate assets, ascertain the fair market value of the assets and obtain the necessary professional appraisals of the estate. 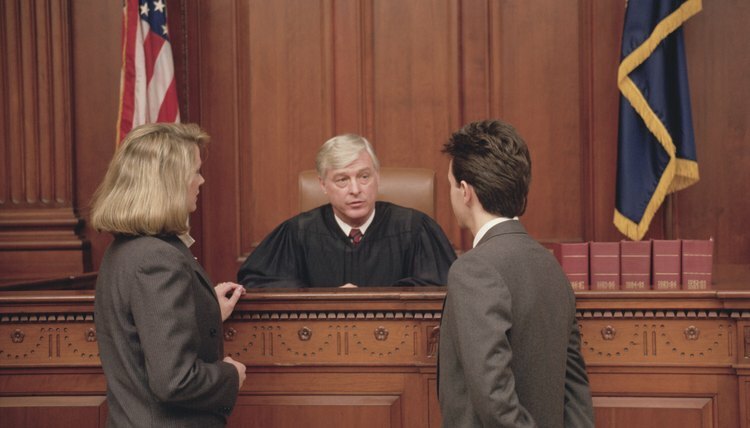 The court must take into account any objection made by descendants or heirs of the estate against the potential estate administrator and may schedule a separate hearing to consider court motions against the appointed administrator. Once the court appoints an estate administrator, it requires the administrator to complete a proper accounting and valuation of all probate property assets. The estate administrator files the probate property inventory form with the probate court, and the court uses the inventory list to assess the value of the estate. The court orders a division of the assets according to the state laws on intestate succession, which differ somewhat from state to state. Under most state intestacy laws, property generally goes to the decedent's surviving spouse or domestic partner, children, parents, siblings, nephews and nieces and down the line of direct descendants. If no direct descendants exist, the estate goes to more distant relatives or the state. The court assesses the need for temporary administration of the estate, permanent administration of the estate or no administration of the estate. Temporary administration may be required to access a safe deposit box, recover a will or arrive at a general consensus among heirs. Permanent administration would last until the estate was distributed in its entirety. In some cases, no probate administration of an estate is required. Although probate laws vary from state to state, many states allow small estates to be settled without prolonged probate proceedings. Some states consider a small estate to be under $5,000, others include estates valued up to $30,000. A court may expedite probate matters if the heirs unanimously agree on a distribution plan and prove that the estate has no outstanding debt. Joseph Candito, Attorney at Law: Executor or Administrator? What’s the difference? When someone passes away owning property in Tennessee, the probate court is charged with supervising administration of the estate. The depth of the court's involvement will depend on the amount and type of property in the estate, and whether there are any objections raised by those who may inherit under a will or by intestacy laws. The process is highly legal in nature, and for all estates valued at over $25,000, Tennessee requires an attorney to open the probate process and to represent the person appointed to administer the estate. Estates valued at less than that amount and having no real property can take advantage of a streamlined procedure known as a small estate probate. Under Michigan law, when a person dies without a will, it is said the person died intestate. The law has rules for what happens to a person's property when a person dies without a will. These rules are necessary because there is no will to provide direction as to how the deceased wished to distribute his property. The probate court will distribute property that was not owned jointly, as well as property that did not have a named beneficiary, according to Michigan law. Estate representatives face the monumental task of reconciling all the deceased's assets after death. After decades of acquiring communal and personal assets, the estate must account for each item and assess its value -- in a matter of weeks. The time frame for filing a property inventory varies from state to state, depending on the rules of the probate court. In most jurisdictions, the court requires an official probate form to be used for the inventory of assets. The estate representative compiles a list of real estate, personal property, bank accounts and debts as line items with a detailed description of each item and its fair market value. Why Does a Probate Require an Appraisal on the Decedent's Property Upon Death? What Are the Requirements for Settling an Inheritance? What Happens When a Person Dies Without a Will?